You can create a window with uniform translucency, where each pixel has the same translucency (or alpha) value. The following screen capture shows a window with 45 percent translucency. 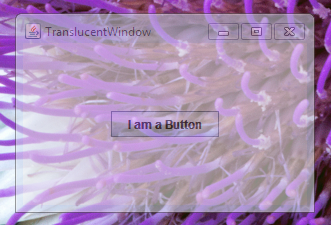 Click the Launch button to run the TranslucentWindowDemo example using Java™ Web Start. This example requires JDK 7 or later. Alternatively, to compile and run the example yourself, consult the example index. You can create a window with per-pixel translucency, where each pixel has its own alpha value. With this feature you can, for example, create a window that fades away to nothing by defining a gradient in the alpha values. The following screen capture shows a window with gradient translucency from the top (fully translucent) to the bottom (fully opaque). 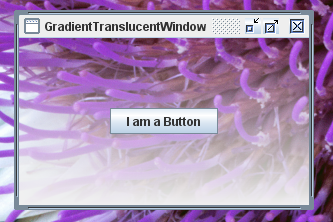 Click the Launch button to run the GradientTranslucentWindowDemo example using Java™ Web Start. This example requires JDK 7 or later. Alternatively, to compile and run the example yourself, consult the example index. You can create a window with any Shape object that you can define. Shaped windows can be opaque, or they can use uniform, or per-pixel, translucency. The following screen capture shows an oval-shaped window with 30 percent translucency. Click the Launch button to run the ShapedWindowDemo example using Java™ Web Start. This example requires JDK 7 or later. Alternatively, to compile and run the example yourself, consult the example index. TRANSLUCENT – The underlying platform supports windows with uniform translucency, where each pixel has the same alpha value. PERPIXEL_TRANSLUCENT – The underlying platform supports windows with per-pixel translucency. This capability is required to implement windows that fade away. PERPIXEL_TRANSPARENT – The underlying platform supports shaped windows. The GraphicsConfiguration class also provides the isTranslucencyCapable method to determine if PERPIXEL_TRANSLUCENT translucency is supported by the given GraphicsConfiguration object. Version note: The translucent and shaped window API was first added to the Java SE 6 Update 10 release as a private API. This functionality was moved to the public AWT package in the JDK 7 release. This tutorial describes the API that is available in the JDK 7 release. See Java SE 6 Update 10 API for a mapping of the private API in the Java SE 6 Update 10 release to the public API in the JDK 7 release. // Determine what the default GraphicsDevice can support. Note: None of these capabilities work on windows in full-screen mode. Invoking any of the relevant methods while in full-screen mode causes an IllegalComponentStateException exception to be thrown. You can create a window where each pixel has the same translucency by invoking the setOpacity(float) method in the Window class. The float argument passed to this method represents the translucency of the window and should be a value between 0 and 1, inclusive. The smaller the number, the more transparent the window. There is also a corresponding getOpacity method. The TranslucentWindowDemo.java example creates a window that is 55 percent opaque (45 percent translucent). If the underlying platform does not support translucent windows, the example exits. The code relating to opacity is shown in bold. // Determine if the GraphicsDevice supports translucency. //If translucent windows aren't supported, exit. // Set the window to 55% opaque (45% translucent). Note that the button is also affected by the uniform translucency. Setting the opacity affects the whole window, including any components that the window contains. Creating a window that uses per-pixel translucency involves defining alpha values over the rectangular area that the window occupies. When a pixel's alpha value is zero, that pixel is fully transparent. When a pixel's alpha value is 255, that pixel is fully opaque. When a pixel's alpha value is 128, that pixel is 50 percent translucent, and so on. An easy way to create a smooth interpolation between alpha values is to use the GradientPaint class. The included example uses this approach. Invoking setBackground(new Color(0,0,0,0)) on the window causes the software to use the alpha values to render per-pixel translucency. In fact, invoking setBackground(new Color(0,0,0,alpha), where alpha is less than 255, installs per-pixel transparency. So, if you invoke setBackground(new Color(0,0,0,128)) and do nothing else, the window is rendered with 50 percent translucency for each background pixel. However, if you are creating your own range of alpha values, you most likely will want an alpha value of 0. While not prohibited by the public API, you will generally want to enable per-pixel translucency on undecorated windows. In most cases, using per-pixel translucency on decorated windows does not make sense. Doing so can disable the decorations, or cause other platform-dependent side effects. To determine if a window is using per-pixel translucency, you can use the isOpaque method. Invoke setBackground(new Color(0,0,0,0)) on the window. Create a JPanel instance that overrides the paintComponent method. In the paintComponent method, create a GradientPaint instance. In the example, the top of the rectangle has an alpha value of 0 (the most transparent) and the bottom has an alpha value of 255 (the most opaque). The GradientPaint class smoothly interpolates the alpha values from the top to the bottom of the rectangle. Set the GradientPaint instance as the panel's paint method. Here is the code for the GradientTranslucentWindowDemo.java example. If the underlying platform does not support per-pixel translucency, this example exits. The code specifically relating to creating the gradient window is shown in bold. // Determine what the GraphicsDevice can support. 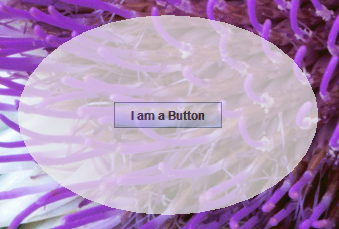 Note that the button is not affected by the per-pixel translucency. Setting the per-pixel translucency affects the background pixels only. If you want a window that has a uniformly translucent effect on the background pixels only, you can invoke setBackground(new Color(0,0,0,alpha)) where alpha specifies your desired translucency. You can create a shaped window by invoking the setShape(Shape) method in the Window class. The Shape argument that is passed to the method determines how the window is clipped. When a shape is set on a window, the window decorations are not re-formed to the new shape, so setting a shape works best on undecorated windows. The best practice for setting the window's shape is to invoke setShape in the componentResized method of the component event listener. This practice will ensure that the shape is correctly calculated for the actual size of the window. The following example uses this approach. The ShapedWindowDemo.java example creates an oval-shaped window with 70 percent opacity. If the underlying platform does not support shaped windows, the example exits. If the underlying platform does not support translucency, the example uses a standard opaque window. You could modify this example to create a shaped window that also uses per-pixel translucency. The code relating to shaping the window is shown in bold. // changes size, the shape will be correctly recalculated. // Give the window an elliptical shape. // If the window is resized, the shape is recalculated here. //If shaped windows aren't supported, exit. // Set the window to 70% translucency, if supported. Changing the public API in an update release is not allowed, so when the translucent and shaped windows capability was added to the Java SE 6 Update 10 release, it was implemented in the private com.sun.awt.AWTUtilities class. For the JDK 7 release, this functionality was moved to the public AWT package. The following table shows how the private methods map to the public methods. AWTUtilities.setWindowOpaque(boolean) Window.setBackground(Color) Passing new Color(0,0,0,alpha) to this method, where alpha is less than 255, installs per-pixel translucency.